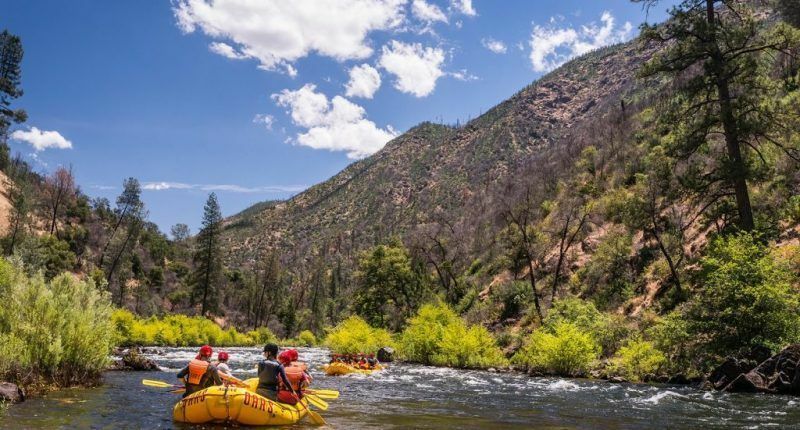 Finding the best kayak for rivers might look challenging for newbies. After all, what's the difference between a kayak for rivers and a kayak for lakes? Moreover, the market is so diversified that you'll end up with a plethora of different choices. Obviously, it pays off analyzing your necessities before making a decision. At the same time, it's highly indicated to go with the best rated items. They sell well for a reason. Plus, they come from reputable and well established manufacturers. So, what are the best selling kayaks in this range and what makes them so special? For those who wants to jump straight into our final verdict, here is a quick recap on our thoughts on the best kayaks for rivers. 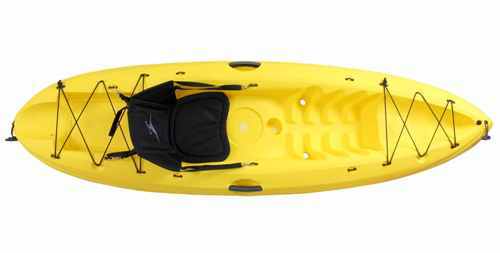 Available in a few different color combinations, the Best kayak for rivers coming from Old Town Canoes & Kayaks is likely to impress. It's designed for one person only and it features an impressive warranty. 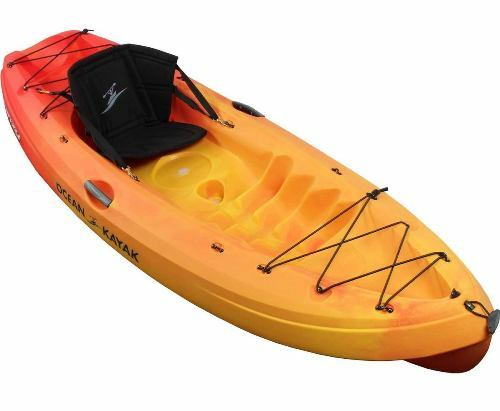 Plus, it's often ranked among the best recreational kayaks as well. The kayak measures 114 inches in length. It's slightly longer than the average kayak in this segment, which means it's faster and easier to control. The extra control is also given by its narrow profile – just 28.5 inches in width. As for height, it goes up to 13 inches. The high ratio of length and width might compromise stability a bit, but it's not noticeable. This model weighs 39 pounds. It's not heavy, but quite easy to take to the beach. However, transporting it requires a special support for your car roof. In terms of comfort, you'll love how welcoming the seat is. It might look like your space is limited, but you do have options. Moreover, the seat is slightly adjustable to ensure a comfortable ride. In other words, your family or friends can use this kayak as well. The seat comes with a thick layer of padding that clears pressure away, so you won't have to change positions too often. Capacity is quite impressive. The stern hatch is excellent to store various things, such as gear or a backpack. Apart from the kayak construction, control is also given by the slight levels of adjustability. For example, you have support track foot braces that can be thoroughly adjusted. Thigh pads are just as handy. They keep your body in one position and prevent slipping. What does that mean? Easy – more control! Focus on what really matters, rather than trying to maintain your balance. 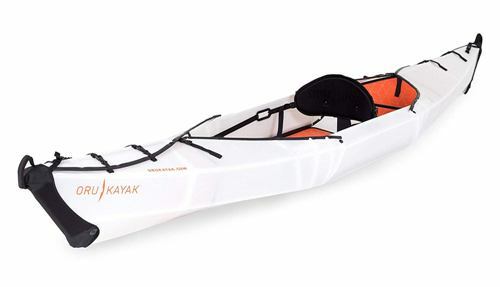 The kayak is not just lighter than other similar models, but it also comes with some comfortable carry handles. Sun Dolphin has managed to take simplicity to a new level with its best kayak for rivers. Given the basic feature of this model, it can also be rated among the best kayaks for beginners. It comes in plenty of colors, from blue and pink to citrus and lime. The kayak is 120 inches in length and 30 inches in width. It's a standard size and a good ratio for these measurements. In other words, it's stable, speedy and easy to maneuver, yet it can't compete with specialized kayaks. It's 13 inches in height too. The internal capacity is one of the most attractive elements. 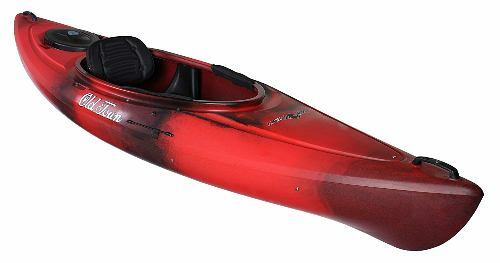 While designed for one person only, this kayak has an impressive open cockpit – so large and spacious that it can easily accommodate large users too. When it comes to its weight, the kayak goes up to 40 pounds. It's in the middle range – not too heavy, not too lightweight. It's still, however, easy to carry to the beach without too much hassle. The foot braces allow plenty of room. They're adjustable, so it makes no difference how tall or short you are. Besides, adjustability allows others to use the kayak, whether it comes to your friends or family. The seat is also adjustable for a more customized experience. Furthermore, you have extra padding for a comfortable ride. Forget about changing your position every half an hour. Even better, the back support is high and soft, so you'll feel like riding in an armchair. The unit is made from Fortiflex high density polyethylene. It is UV stabilized. Leaving it in direct sunlight for ages won't affect its colors and brightness. It's quite rugged for durability. Some might complain about the rugged design because it can cause friction and reduce the speed, but this issue is insignificant. Gear storage features shock cord deck rigging. There's plenty of storage for a large backpack or other gear. Furthermore, Sun Dolphin has fitted this kayak with a spray deflector collar, making it one of the most efficient kayaks. Although rated as the best kayak for rivers from Point 65 Sweden, this model is also the best touring kayak for those who put convenience first. It has an innovative construction and simple features that will never give you too much headache. The kayak measures 116 inches in length. It's slightly shorter than its competition. However, it comes with a 29.5 inch width. In other words, it maintains good proportions if you're interested in having a bit of everything – speed, stability and maneuverability. Weighing 61.8 pounds, it's among the heaviest kayaks in this segment. It shouldn't put you off though. You can still drag it to the beach. You might face some challenges while trying to fit it on top of your car, but that's pretty much it. Point 65 Sweden can certainly go on the kayak brands list excelling at innovation. This model is built with convenience in mind. You can use it for yourself, but you can also use it in tandem – just get a friend and start paddling. The Snap-TAP technology used in its built was patented, so you're less likely to see it in another manufacturer. The kayak is conveniently splittable in the middle, so transportation is a piece of cake. If you already have a roof support for your car, you can transport it in one piece. If you don't, then break it apart and put it back together on the beach. In terms of comfort, you have a comfortable seat that won't put too much pressure on your lower body. In fact, it's an air seat, so you'll feel like sitting on a cloud. The size makes this kayak easy to turn and track. According to the manufacturer, tracking has been improved since previous versions. Ocean Kayak is known for developing some of the best kayaks on the market and this model can certainly qualify for a top unit. It can take one person and comes in three different colors - sunrise, envy and yellow. Measuring just 108 inches, this might be the best kayak for rivers in this range. It's smaller than its competition, so it's easier to control. It's quite wide for its length though – 31 inches. When used on calm waters, it won't give you too much speed. As for its height, it goes up to 18 inches. The kayak weighs 44 pounds only. It's easy to lift, but also easy to transport and store due to its handles. It can take riders up to 325 pounds in weight. Experienced riders can exceed this limit. Based on its sit-on-top design, this model can also be rated as the best beginner fishing kayak. It's the right way to use it on calm waters though. Despite this build, it does have a small molded pattern on top of it, so the rider knows exactly where to seat. Seating is extremely comfortable. The seat is double padded and it features a back as well. It's cushioned and supports the lower back. Worried about not finding the perfect position? Forget about it! The seat can be adjusted in four different positions. Storage should never be a problem. You have a stern tank well fitted with removable bungees. You also benefit from a bow deck bungee. You can store a few large backpacks, multiple bags and various gear for your trip. Apart from the carry handles, users will benefit from molded side handles too, not to mention the molded cup holder. The rear skid plate is replaceable and comes with a spare unit for durability. 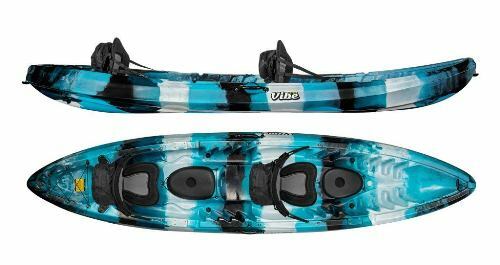 The best kayak for rivers from Vibe Kayaks comes in three color combinations and can be used in multiple environments. Not only is it versatile, but it makes one of the most stable touring kayaks as well. This model comes as a one person model. It's a sit-on-top kayak that plenty of past buyers rate as the best kayak for fishing too. It does come with a few extra features to support fishing though. All in all, it measures 146.4 inches in length – more than 50% longer than some of its competition. It's 33 inches in width, so the ratio underlines one thing – it's speedy and easy to control. Sure, it may not be as stable as an extra wide kayak, but speed will keep you on track. In terms of storage, you have a large middle console, as well as a 20 inch front oval hatch. The rear hatch is just as handy, while the rear tank well boosts the maximum available space. You can easily store a few backpacks and some bags. Control is boosted with some simple, yet innovative features. For example, you have a toe controlled rubber system. It's pre-installed. Its main role is to preserve energy during long trips or windy days. 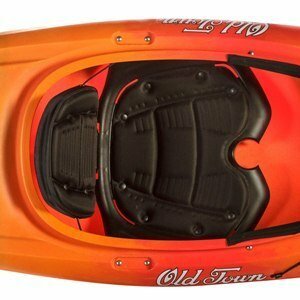 The flush mount rod holders underline the fishing profile of this kayak. The same goes for the integrated gear tracks for customized rigging. There are four of them. It's worth noting the comfortable seat based on the Vibe Hero technology. It features a dual position, as well as back support. 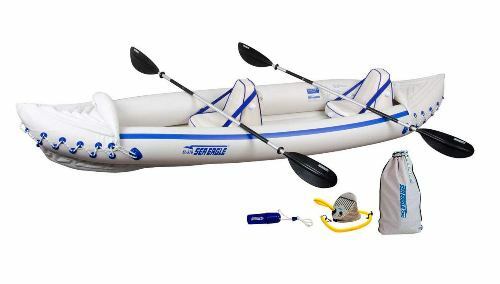 You just cannot overlook Sea Eagle's inflatable model when hunting the best kayak under $350. This model is built with more feature than many other kayaks in this segment, not to mention the benefits of its inflatable profile. Being inflatable, this unit could be the best kayak for rivers if you're looking for portability. Basically, when deflated, it can go into a backpack and the backseat of your car. Transportation is a breeze, as well as storage. Forget about roof supports, trailers or even help from someone else while trying to lift a heavy hard kayak. This model only weighs 26 pounds. Besides, when inflated, it's as stiff as a hard kayak. 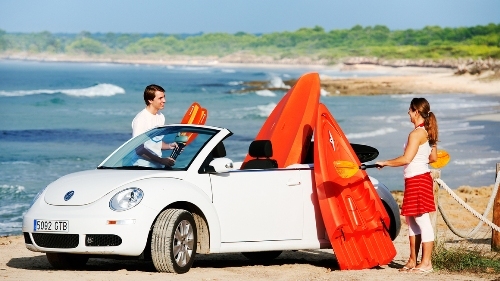 The design makes the kayak suitable for up to three people. It has an exquisite 650 pound maximum weight capacity. It's suitable for up to class III whitewater. The package is complete and won't ask for any extra spendings – something that all manufacturers should do. 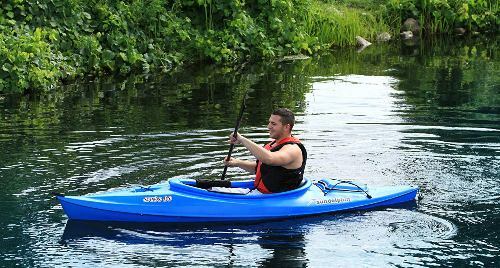 Apart from the inflatable kayak, you also have two paddles, inflatable and removable seats, a foot pump and a carry bag with a shoulder strap. The kayak comes with a couple of skegs on the bottom. Their main role is to improve speed and tracking. It measures 144 inches in length. Also, there are five one way inflation/deflation valves. There are a few compartments in its composition, so it will float even if unexpected situations arise. 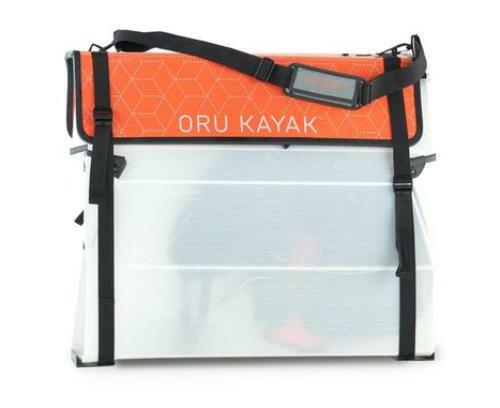 The Beach model from Oru Kayak could be the best kayak for rivers if you're after portability and speed. It's a deluxe kayak bringing in the best features from its competition, but without useless bells and whistles that no one can find a use for. This kayak is designed for one person. It comes in a white, orange and black combination. It's made from polypropylene. Unlike other similar kayaks, it's designed to last for ages if properly looked after. 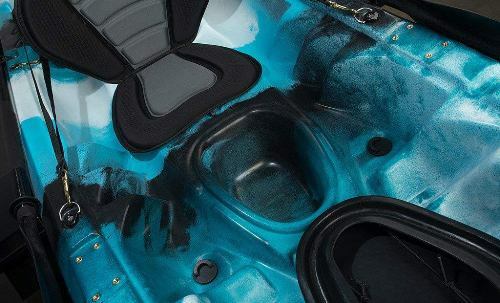 Polypropylene is not just durable, but it also slides on the water much easier than other materials, so you're likely to experience fast speeds too. The kayak is 144 inches in length and 28 inches in width. It's quite narrow, so it's not as stable as other kayaks. However, stability goes with the speed. This kind of ratio makes it speedy and easy to control. The cockpit is quite large – 62x22 inches, so it can take overweight riders too. It's suitable to users up to 300 pounds in weight. Experienced riders can exceed the recommended maximum weight though. Despite the materials and size, the kayak is quite lightweight. It only weighs 26 pounds. It's easy to lift and carry to the beach and it won't cause any discomfort. It has an interesting design, as it folds and can fit into a backpack. Folding can be a bit tricky in the beginning. Once you understand how it works, it'll become the ideal kayak. 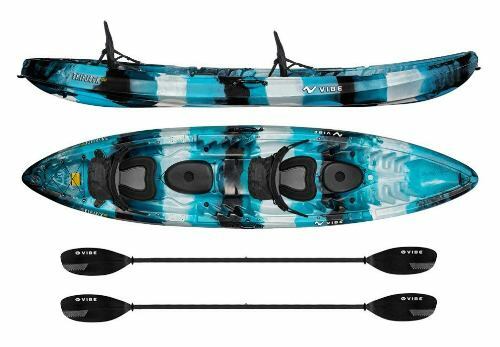 Built to be attractive and promoting simplicity, the Venus 10 model from Ocean Kayak is the best kayak for rivers if you're a woman. Sure, men and children can also use it, yet it's mostly advertised to the ladies. The kayak is 118 inches in length – pretty long for a women's kayak, but still within the standard limits. It's 28 inches in width, so it has both speed and stability. It's designed for one person only. It's available in a longer version as well – 128 inches. Weighing 43 pounds, it's portable and can be carried to the beach, yet small women might face some trouble – especially when lifting it for car roof transportation. The maximum load is rated at 175 pounds. It's quite enough for most women. The kayak can also take overweight riders. Experienced riders can slightly exceed the maximum recommended weight, yet it depends on the kind of water they ride in. Considering it's a one person kayak, the unit features lots of storage – both behind and in front of the seat. It's enough space for a few backpacks or various gear. In terms of comfort, the Comfort Hybrid seat will make your day. It's soft and comes with extra padding, but also some back support. Some of the extras include a bungee for storage and a car topping handle system that helps to load the kayak, as well as a drain plug. 1. What are the differences between a kayak and a canoe? Kayaks are usually paddled with a double ended paddle. They are extremely diversified too – kayaks for touring, fishing, yoga and so on. Canoes come with a single ended paddle and the rider sits up higher. They're not as diversified either. 2. How can I transport a kayak? There are multiple ways to transport kayaks. Most of them can easily fit on a classic roof rack, regardless of what car you have. Ideally, the kayak should be upside down and strapped over the top. Some models are large and bulky, so certain people rely on trailers for transportation. 3. How should I store my kayak? If you use it in saltwater, you should rinse it off after each use. It's not a good idea to keep them the right way up on the floor, since hulls might flatten overtime. They're ideally stored on end. If you don't have enough space, do it upside down on various supports. Those who store their kayaks outdoors should cover them for protection. Inflatable kayaks must be thoroughly dried before storage or they might become moldy. Storing them is a piece of cake – cabinets, backpacks, carry bags and so on. 4. What types of kayaks are out there? There are plenty of different kayaks on the market. They can be classified by multiple criteria too. 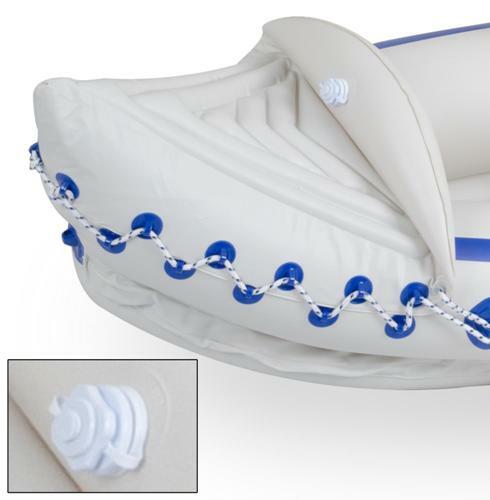 Most importantly, you can find hard or inflatable kayaks. Also, they come with certain sizing standards and storage options, so you'll have yoga, fishing, touring or racing kayaks. Recreational kayaks are general and work with anything, regardless of your skills or expectations. 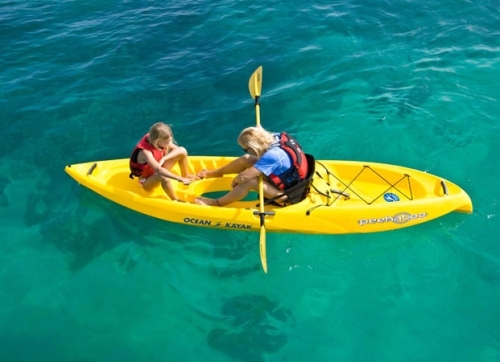 You will also find kayaks for men or women, not to mention tandem or single kayaks. 5. What's the perfect kayak for me? To answer this question, you'll have to identify your personal needs and expectations first. What works for some people may not necessarily work for you, hence the necessity of some research. Think about what you expect from this experience and how far you'd like to go. Bottom line, deciding on the best kayak for rivers is entirely up to you. The above mentioned models certainly dominate the market, yet small aspects make the difference. They're among the best sellers, mostly because of their quality standards, durability and features. Consider your preferences and expectations, then you can start researching. From many points of view, Heron 9XT from Old Town seems to be the most complete kayak, regardless of your skill level – it's just a bit of everything. Am happy that you enjoyed it.